ATLANTA -- NFLPA executive committee president Eric Winston stressed the need to prepare just in case there is a 2021 lockout, including saving up funds from Madden likenesses and other marketing ventures. Winston explained how the "Madden checks'' collected over the next three years could equate to $60,000 per player, maybe not a significant number when weighed against lucrative NFL contracts but an amount that would offer some fallback in case of a work stoppage. Winston said it is referred to as the "Madden checks'' because EA Sports is one of the most significant contributors. There are other contributors such as Fanatics and Panini America. "It could even be something like -- who knows what happens with their health insurance -- a way for them to purchase health insurance if there happens to be a lockout,'' Herzlich said. "Yes, it doesn't seem like the amount of money that's necessary to live on an NFL salary, but if we can't control the situation, players can be like, 'Look, my family comes first. I've got to protect the health of my family.' Little things like that are where that money will help. NFLPA executive director DeMaurice Smith reiterated what he previously said about the status of negotiations toward a new collective bargaining agreement. Smith said his stance is to prepare the players for the possibility, not that a lockout is inevitable. During Thursday's news conference, the NFLPA approached the topic of alternative forms of pain management, including marijuana, without declaring it a necessary change. Members discussed looking more into the root of such pain issues, such as padded practice time and if it needs to be cut down even more after significant changes already have been made. 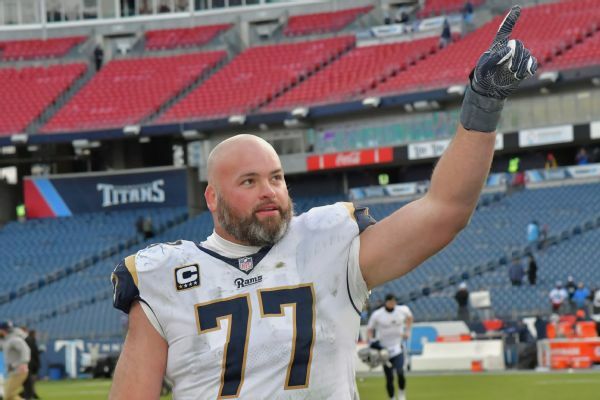 The NFLPA also named Rams OT Andrew Whitworth as the 2019 Alan Page Community Award winner. Whitworth donated his Week 10 game check [$60,000] to Ventura County Community Foundation's Conejo Valley Victims Fund in helping families of 12 people who lost their lives.